Review: Avazzia PRO-SPORT is the top of the line professional hand held microcurrent machine for advanced non invasive pain management experts like orthopedic surgeons, chiropractors, atheletic coaches and trainers and any healthcare practitioners to eliminate a wide range of conditions like sorenes and pain. 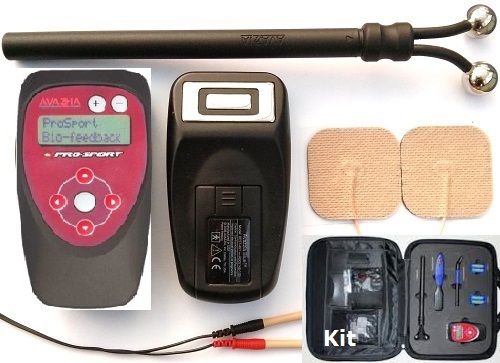 The Avazzia Pro Sport is a professional effective “5 modes, 4 biofeedback modes, 19 advanced modes and programmable” micro-current biofeedback device running on 2 AA batteries with a port for plugging in the external electrodes. A kit version is available with Y, brush and pencil electrodes. Ideal for the professionals. Reimbursable in the USA with most medical insurance carriers. Click arrow to choose the best option for you. Let’s get you out of pain FAST. Avazzia BEST Electrical Energizers are sold with a limited one-year warranty against defect of material or workmanship. Avazzia liability is limited to replacement or repair of product only, at manufacturer's discretion. Warranty term is 12 months from the date of purchase. A receipt is necessary to validate warranty. Merchandise purchased for shipment to an address in the U.S. may be returned for credit or exchange within 30 days of purchase, subject to 10% restocking fees. Allow 14 days processing time once merchandise is shipped. Customer is responsible for all shipping charges. If the return is the result of Avazzia's error, shipping charges will be refunded. Returned electronic devices are subject to a 10 percent restocking fee.